LANCASTER, CALIFORNIA, UNITED STATES, October 29, 2018 /EINPresswire.com/ — Lindsey Optics introduces it's new product range of Brilliant² Rota-Streak rotating streak filters for cinematography that fit 4×5.65 cine matte boxes. The Brilliant² Rota-Streak Filter range includes a wide range of filters for unique in-camera static and rotating flare effects. They create exciting streaks on any bright lights and specular highlights in a scene. Brighter lights create bigger streaks, weaker lights create smaller streaks. By choosing the right Rota-Streak filter strength for a particular scene, streaks can be dramatic, subtle or somewhere in-between. Some Brilliant² Rota-Streak filters in the product range produce flares that precisely imitate the anamorphic lens flare characteristic of many Cinemascope films. This anamorphic streak is a form of lens flare that appears as horizontal lines extending from bright light sources and specular reflections. Other recently developed Rota-Streak filters can produce even more dramatic lens flares with various unique characteristics and colors. The unique Rota-Streak Swirls create beautiful elliptical flares on specular light sources and highlights. Rota-Streak filters are permanently mounted in a 4×5.65 geared filter tray that allows rotation of the flares for static flares at any angle, or for dynamic rotating streak, star and swirl flare effects. A 1/4 20 threaded hole in the handle allows mounting a motor for dynamic rotating streak, star and swirl effects. 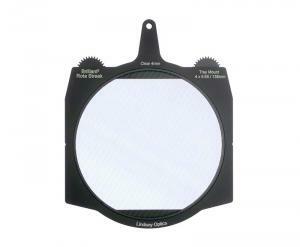 Lindsey Optics uses a unique manufacturing method to laminate very small cylindrical rod lenses inside the glass filter. By incorporating the rod lenses with different spacing, a variety of streak effects can be achieved. A closer spacing creates a stronger effect, a wider spacing creates a weaker effect. 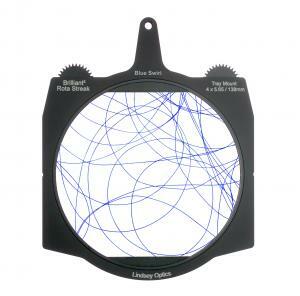 Brilliant Streak Filters are available in 7 types: 2mm, 3mm, 4mm and 6mm, Diamond Star, Confetti and Swirl patterns. They are available now in 6 colors: Clear, Blue, Yellow, Green, Pink and Red. They are priced at $425 each. Brilliant Streak Filters will be initially available in the Brilliant² 4×5.65/138 Rota-Streak size that is designed to fit in most professional 4×5.65" Matte Boxes.